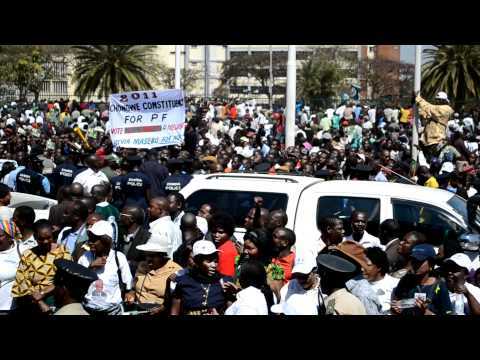 The ruling PF in Lusaka Province has vowed to wipe out the opposition by 2016. PF Lusaka Province Chairman Goodson Banda told a media briefing in Lusaka that the results of the Feira parliamentary bye election have shown that the opposition is becoming irrelevant by the day. “By 2016, the opposition will be no more. Zambians have demonstrated that they don’t need opposition parties anymore, what Zambians want now is development,” Mr. Banda said. Mr. Banda said the opposition will be no more by the time that goes to another general election in 2016. He said the PF’s victory in Feira and other ward by elections is not surprising. Mr Banda said the PF is now even more geared to go and beat the opposition in Kafulafuta, Solwezi East, Chipata Central, Sinazongwe, Mkushi and any other upcoming bye elections. “People like HH (UPND leader Hakainde Hichilema) should be taught a lesson that arrogance in politics does not pay.